This did not do it for me. I felt like this was a very generic, ‘almost great’ moisturizer. It wasn’t bad – it’s a nice moisturizer – but it just didn’t stand out as one I’d purchase again. This cream isn’t too rich, so it would be worth trying if you have oily, normal or combination skin. It also didn’t irritate my skin in slightest. It actually felt quite calming. The product was also easily absorbed and had a very nice texture. For my very dry skin, this wasn’t quite effective enough. My skin just felt ‘not quite quenched’ – almost like the product was a tease. Keep in mind though, that my skin is dry and that I’m also in a dry climate. If you are at lower altitude, in a more moderate or humid climate, or if your skin is normal to oily, you might really like this product. Price. 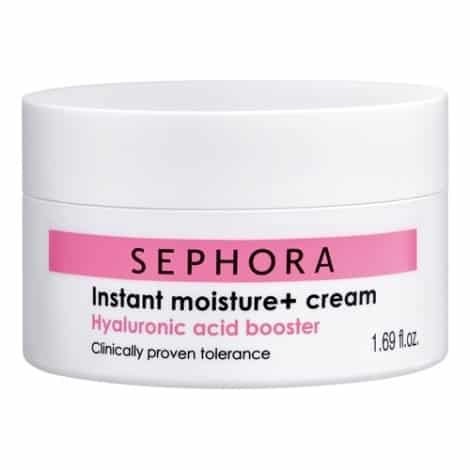 Although Sephora Collection Instant Moisturizer + Cream isn’t terribly expensive, I did not think it was near worth the price. You can spend a little more and get an amazing moisturizer, like belief’s The True Cream Moisturizing Bomb or GlamGlow’s ThirstyMud, which I love using daily. Or, you can spend quite a bit less and get one that’s just as good, if not better, like L’Oreal’s Collagen Moisture Filler.